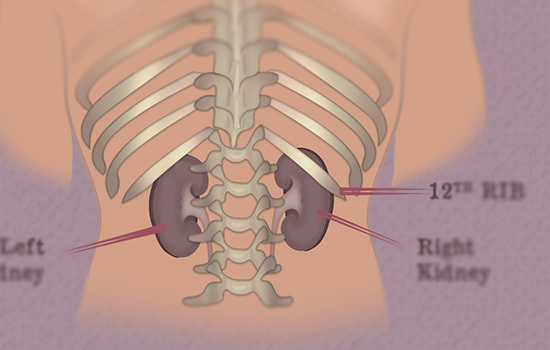 The kidneys are a pair of bean-shaped organs found below the rib cage on either side of the spine. Each kidney is roughly 4 -5 inches in length and weighs 1/3 of a pound. The kidneys filters over 30 gallons of blood per day and produces urine which contains excess waste, electrolytes and water. The blood flow to the kidneys is very important as they receive 20% of the blood pumped by the heart every minute. Blood travels from the heart, through the aorta, which delivers a branch to each kidney. The kidneys clean this blood and extra waste is excreted as urine. Urine flows through two hollow muscular tubes called ureters into the bladder. The bladder itself is a muscle which remains relaxed until it fills up with urine. Once filled, the bladder sends electrical signals to the brain to be emptied.